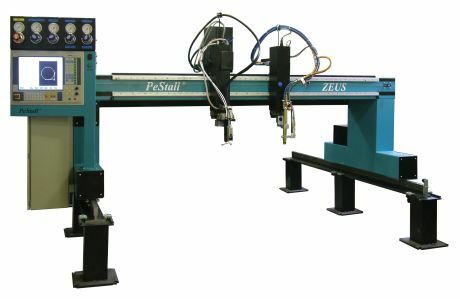 This machine is the latest word in oxyacetylene and plasma cutting, making use of the most up-to-date oxyacetylene and plasma technology available today. Its working width is 1500 - 4000 mm; working length from 3000 - X mm. The machine can carry up to 4 torch carriages for oxyacetylene or plasma cutting torches. A robust cutting machine with gantry, or portal, design and dual side drive, this machine runs along the longitudinal axis on precise rails. Each torch carriage moves along the precision maintenance-free double guides with polished rollers in the Y axis. For the vertical stroke of each torch, polished rods are used with ball pockets. A powerful AC motor is used to drive the machine in all axes, with precision planetary gearboxes on all axes travelled. This system ensures not only smooth trouble-free running of the machine but also a positioning accuracy of 0.1 mm. Feed rate control is stepless 0-12 m/min. ; the rate of movement in fast mode is adjustable up to 30 m/min., acceleration up to 1000 mm/s2. The machine is controlled by the MEFI 872 iTD (Windows) control system with a convenient control desk, which is based on a dual-core, high performance industrial computer with a 15” colour LCD touch screen monitor. 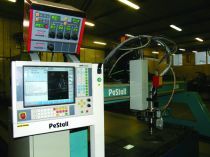 The system facilitates the use of standard features including a course return after manual removal from the shape, the option to enter the kerf directly on the machine, the ability to travel back along the shape, rotating the outline based on the position of the sheet metal on the work table, warm-up time after the first burn stored in memory, etc. The cutting layouts can be transferred to the machine via USB Flash Disc, LAN or wireless data transmission. In addition, the control system includes a basic set of macros, which make it possible to program the cutouts directly on the machine, and which can be expanded with preset shapes based on customer requirements. The advantage of this control system is built-in circuit diagnostics with error indication on the monitor and technical data entered from the parameter table. The system includes high level control of the plasma burn mechanism and voltage control of the torch height.